Otherwise known as the “Proxy Directive”, patients may discuss treatment options and potential procedures with their physicians. But you may not be able to exercise this important right if you suffer a serious injury or long-term unconsciousness. This is why you should strongly consider enacting an advance health care directive. 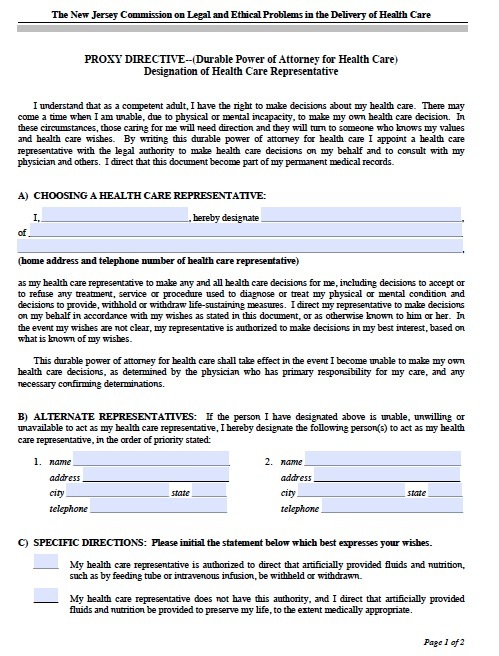 Directives are legally binding, so you can rest assured your medical treatment decisions will be followed. A directive can also prevent disagreement among your loved ones, especially regarding emotional end-of-life decisions. One directive allows you to name a healthcare representative. In New Jersey, you can give the representative broad authority to make all healthcare decisions for you, including whether to continue life-supporting treatments. But you can also limit the representative’s power. It is especially important to specify whether you want to receive artificial nourishment or cardiopulmonary resuscitation, as these decisions can be among the most difficult for loved ones to make.